Relax and re-connect in this beautiful luxury vacation cabin rental. 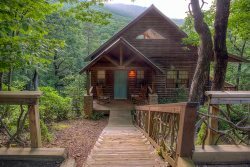 Nestled in the N Georgia mountains, perfect for couples, stunning views of Mt. Yonah. Big Sky has it all! Satellite TVs in the Master, Living Room and Lower level, DVD, fully equipped kitchen, beautiful rock fireplaces on both the upper and lower levels, and plenty of room to unwind! 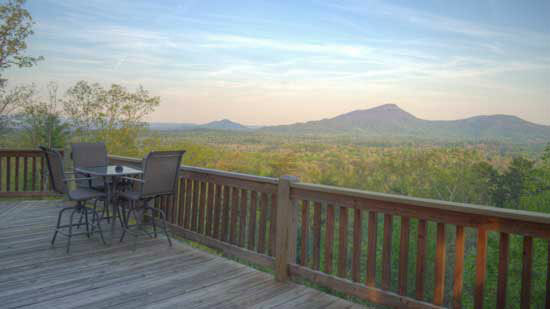 Both luxury and comfort await you in this 1 Bdr Helen GA vacation cabin rental. Oversized spa towels and soft comfy robes beckon you for one more soak in the master spa tub, with your rustic log bed just steps away! It's the perfect spot to relax and watch TV, or get a great nights sleep -- the ultimate in relaxation! The lower level also offers plenty of pleasant diversions including a regulation pool table, pub/gaming table, comfy sectional to cozy up in front of the fireplace and take in your favorite shows, or relax with a good book. The private hot tub on lower deck is the perfect spot to relax and soak up the incredible mountain vistas or listen to the gentle babbling of the brook located on the lower property. Whatever your pleasure, you'll find it at Big Sky! Although you may not want to leave this luxury mountain cabin, Big Sky is an easy 7.5 mile drive to the village of Alpine Helen GA, where an array of wonderful restaurants and attractions await! Accessibility: Paved/gravel road and gravel driveway, accommodates up to 2 vehicles. Stairway into cabin. Big Sky is approx 6.5 miles from Helen! Only dealt through email prior to stay to ask a question but received a quick response and everything went smoothly. We had a very relaxing time. Loved the nature sounds and stream. Saw a deer one day but unfortunately it ran when it heard us. Spectacular view and very secluded. Also loved the fireplaces. Breathtaking view! It's the place to go to forget all the stress of work and the daily grind. Returning home was hard. Can't wait to go back! She was super friendly and offered me a discounted rate. The whole transaction was done online and via email which made it super easy and convenient. 5 minutes tops and we were done. Sky High was the cutest, most perfect little cabin for us. Comfortable, great views, private, quiet. Staff was helpful and friendly!! Big Sky is an amazing property and the view is worth every penny!! Serenity Cellars is located right at the entrance to community. The stay was absolutely fantastic and loved the views of Yonah! Waking up to the view of the mountains was fabulous! Ashley was fantastic as always!! Definitely a delight speaking with a familiar voice again, and I definitely look forward to working with you guys soon in the near future!! Big Sky was definitely a surprise property. From the time we entered the property we were taken back by the breathtaking views and the features and amenities of the home. I definitely enjoyed the lower level of the home and jacuzzi tub in the master bedroom. Easy, simple booking and stay process. Loved It! Big Sky is amazing and beautuful! wonderful property - wonderful time! Beautiful lot, couldn't be in a better location and spot. I highly recommend it. Is a beautiful property and enjoyed our weekend! Excellent response time and friendly, helpful service. Most relaxing stay I have had at a cabin ever. Loved the cabin. Views were excellent and looking at the stars at night while in bed was the most relaxing time I have ever experienced. The service desk lady was very friendly and helpful. So was maintenance. We had a wonderful time during our stay at the big sky cabin. It was everything we hoped for and better. The hardest part was to leave. We will definitely be back either in the fall or in the wintertime for the Christmas market in Helen. The lady that I talked with on the phone was great! Super friendly. The Cabin was every bit and more than we expected. The cleanliness was great as I'm a stickler! The view was amazing and location was just perfect! Down the street from a nice winery and only 10 minutes away from Downtown Helen! I will be definitely coming back again! This cabin was more than I expected. As I walked in the door the mountain view was simply amazing. The cabin was clean and cozy. The kitchen was equipped with everything you would need. I have recommended the Pinnacles to all my family and friends and plan to return within the next few months. We left two of our blankets behind and when we called you were assured the blankets would be mailed back to us. It couldn't have been easier. Your staff have been knowledgeable and very nice when we have called and emailed. Several people have asked for your contact info. when they saw our amazing pictures of Big Sky! We were so impressed and am beginning to think about a family gathering in one of your bigger cabins for the future. Your directions from central Florida were spot on very easy to follow! Thank you for making our Christmas restful and memorable!